Cozy Restaurant Reservation helps you to take and then manage reservations and customers for your restaurant, bar, pizza parlour, cafeteria, conference hall, party hall or nightclub. Cozy Restaurant Reservation is a system designed to replace the pen & paper diary while still maintaining a diary look and feel for ease-of-use. Whether you are a small cafe, or a large restaurant chain, we are certain that after using Cozy Restaurant Reservation, you'll wonder how you ever managed without it! It's highly flexible, allows changing time intervals, creating numerous profiles and viewing multiple schedules at a time. Managing repeat customers and recording customer preferences helps you to retain your customers. Make food allergy notes, record special events and birth dates. Make your customers feel unique and special by recording personal notes. The program gives you a customizable Date Navigator and comprehensive reminder. All information stored in Cozy Restaurant Reservation can be secured with a password preventing from unauthorized access. To safeguard your data, you can also take advantage of the adjustable Auto Backup feature and save the data to the secured archive. Additionally, the schedule can be exported to a variety of formats, including iCal, MS Outlook, XML, PDF, HTML, XLS and TXT. Thus you can use your schedule in different applications. When you need a printout of your schedule, you'll certainly appreciate the powerful Print Designer. It'll help you to print your schedule in the most convenient form, choosing from a number of templates. You pay for the program only the first time and get all new versions of this program for FREE and for a lifetime! 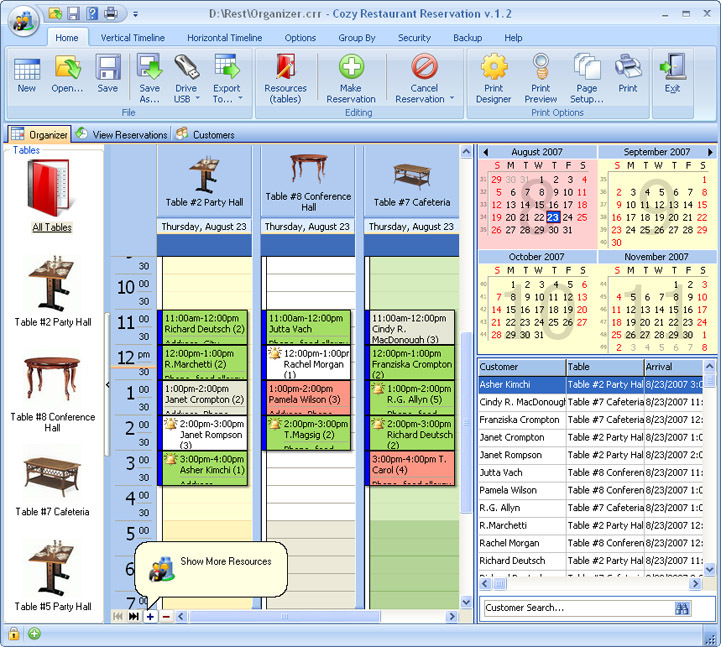 restaurant software,reservation software,pizza,scheduler,cafe software,food,party,bar,nightclub,cozy,organizer,planner,Outlook,calendar,night club,cook,waiter,cafe software,restaurant organizer,restaurant reservation,restaurant business Cozy Restaurant Reservation is a must-have schedule management tool for any restaurants, bars, pizza parlours, conference halls, party halls, cafeterias. The program has data import, export, password protection, backup copying and printing features.